NATO flagship HMS Chatham made a dramatic rescue of 23 seamen from a merchant vessel off the coast of Somalia on Friday 21 May 2010. The Royal Navy warship had been patrolling the sea area approximately 80 miles (130km) west of Socotra as part of NATO’s counter-piracy Operation OCEAN SHIELD when the drama began early in the morning of Thursday 20 May. HMS Chatham’s bridge team received a distress call from the Master of MV Dubai Moon, who said that his ship was caught in a tropical storm 90 miles (145km) south west of Socotra and struggling to make headway in extremely rough seas and high winds. The warship immediately made best speed towards the stricken vessel. As HMS Chatham made her way into the storm, the weather worsened into a tropical cyclone and the situation onboard MV Dubai Moon became even more perilous. 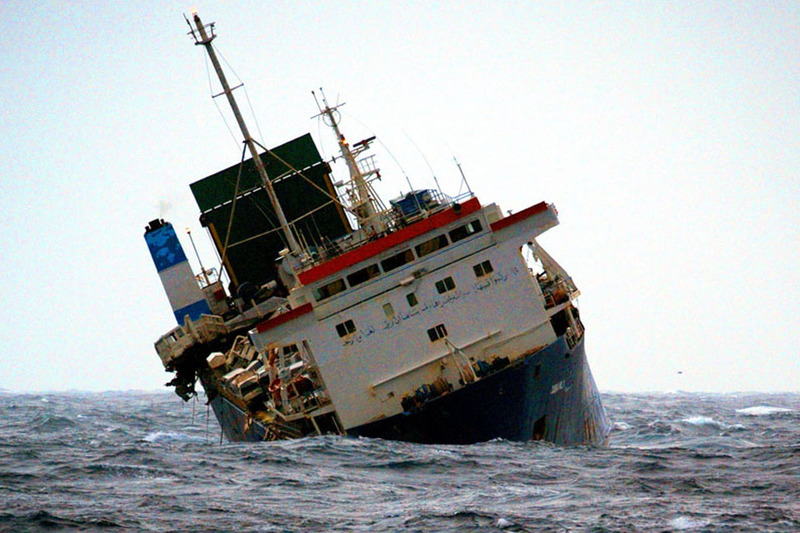 Listing heavily, with her cargo of vehicles crashing around the deck, she drifted ever closer to a small island off the coast. It was only due to the tireless efforts of the Master that she avoided running aground. The Master and HMS Chatham’s Commanding Officer, Commander Simon Huntington, spoke throughout the night trying to determine the best way to save the vessel. At daybreak on Friday 21 May Dubai Moon dropped her anchors in an attempt to hold her position as by now she was getting ever closer to another, larger island, Jazirat Samhah. 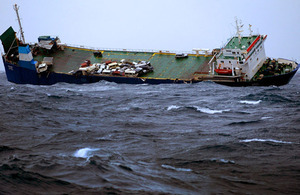 Whilst her anchors did not take permanent hold, they prevented her from running aground onto a reef, which she cleared by less than 1,000 yards (900m) before being pushed offshore by the wind. As the day wore on the weather improved slightly, presenting HMS Chatham with an opportunity to rescue the crew. In very challenging conditions, the warship launched her Lynx helicopter and, in an operation which lasted for over three hours, the 23 seamen were winched by helicopter to safety from the MV Dubai Moon. The relieved seamen were given hot drinks and blankets when they landed onboard HMS Chatham. This rescue was conducted in the most challenging sea conditions imaginable and I am extremely proud of my ship’s company whose sole focus was to assist the Master and crew of MV Dubai Moon. It was, without doubt, the professionalism and courage of my sailors and aircrew that ensured this rescue was a success. The tropical cyclone tested the ship and everyone on board; it is the quality of our people, equipment and training which has resulted in the Royal Navy saving the lives of fellow mariners in such demanding circumstances. Normally we operate close to the coast, but we had to go far out to sea to avoid pirates. That meant we could not find shelter from the storm. If we had not been rescued by the Royal Navy and NATO we would have died with my ship. They were the only people to respond to our distress call; we owe them our lives. HMS Chatham is leading the NATO Task Force posted to the area to counter piracy. As part of this operation, on Friday 14 May, in a co-ordinated search with an EU Naval Force maritime patrol aircraft, HMS Chatham’s Lynx helicopter spotted a suspected pirate vessel towing two attack boats approximately 150 miles (240km) off the coast of Tanzania. After monitoring the vessel through the night, at dawn, in a well planned operation, the pirates were forced to surrender by the overwhelming force posed by HMS Chatham, her Lynx helicopter and fast boats containing the ship’s Royal Marines detachment. The two smaller attack boats were separated from the larger craft by the Royal Marines team and the warship and her Lynx helicopter used their combined firepower to destroy the smaller craft, ensuring that the suspected pirates could not continue with their mission.